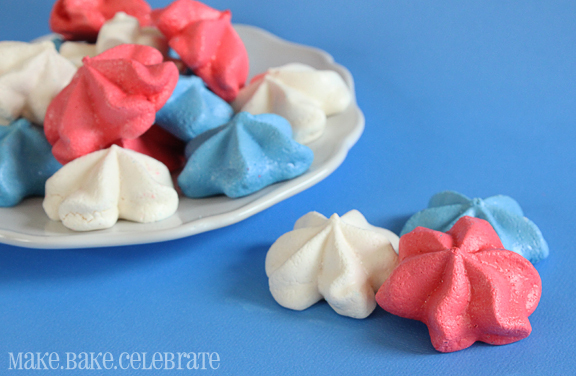 I am having a hard time beliving it's time for 4th of July projects. The last few weeks we've been enjoying each day out in the warm sun, playing in the pool, water table, on the swing set, riding bikes, grilling out....anything to keep us outside. However, it seems like mother nature got a little confused this weekend because when I arrived back in NY I felt more like making hot chocolate and snuggling the girls on the couch. It's cold raining and seems to be hanging around. Ugh. Where were we? Oh yea 4th of July, which by the way really is 4 weeks away...despite the fact that were busting out coats here. 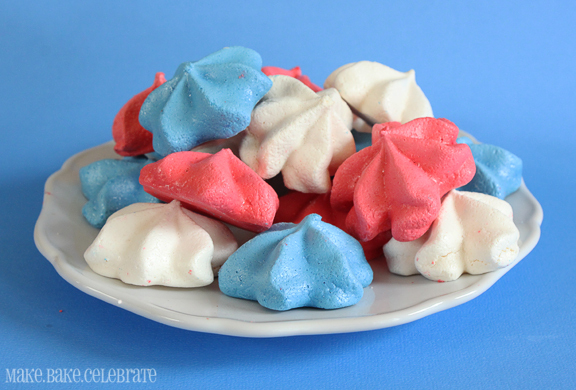 I love making 4th of July treats it's so simple. Red, white, blue, stars...and you've pretty much covered it. But I wanted to share with you guys a few treats this year that don't involve blueberries, strawberries, and whipped cream :). Step 2: Set up your work station. 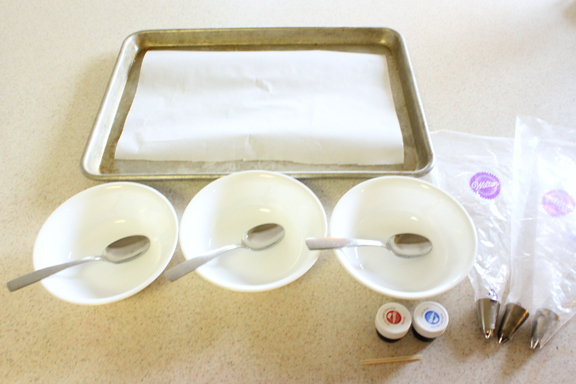 Line 1-2 baking sheets with parchment paper. 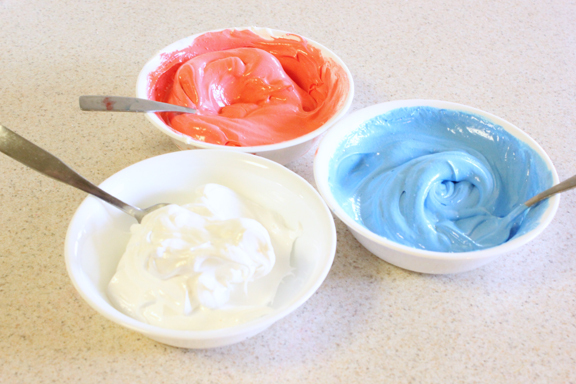 Set out 3 bowls with spoons, red and blue food coloring, and 3 icing bags with tips in them. If you don't have 3 bags and tips, you'll be fine you'll just need to rinse and dry the bag in between colors. Getting everything set up before hand makes the process smooth and quick. 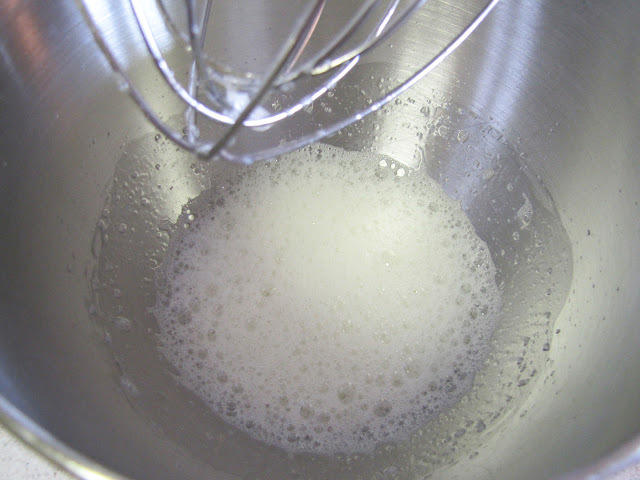 Step 3: In an electric mixer beat room temp egg whites until white and foamy. Step 4: Add in salt and cream of tarter beat until soft peaks form. Step 5: Set your kitchen timer for 7 mintutes. Turn your mixer on a medium speed. Whie mixing slowly pour in your sugar taking the whole 7 minutes to do so. 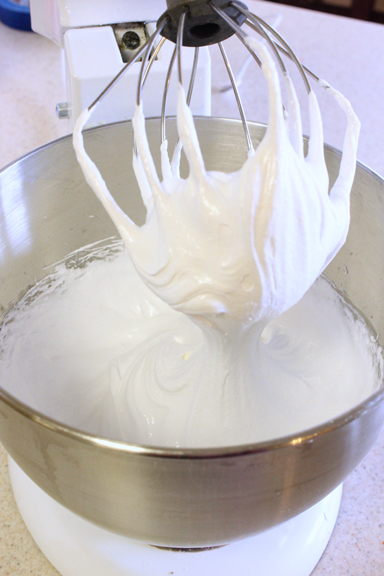 It should now look very similar to marshmellow fluff! 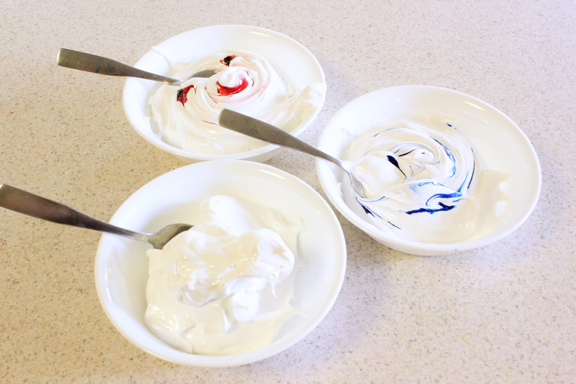 Step 6: Seperate meringue into three bowls. If you plan on stacking the cookies in red, white, and blue layers I would reccomend slightly putting more in the red bowl and slightly less in the blue bowl. Add blue coloring to one and red to another. Step 7: Mix well. 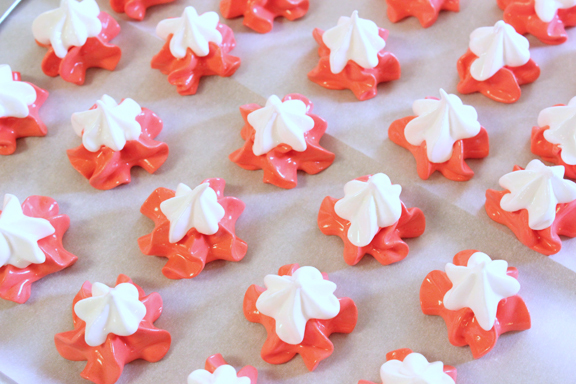 Fill piping bag with first color, red if you layering red, white, and blue. 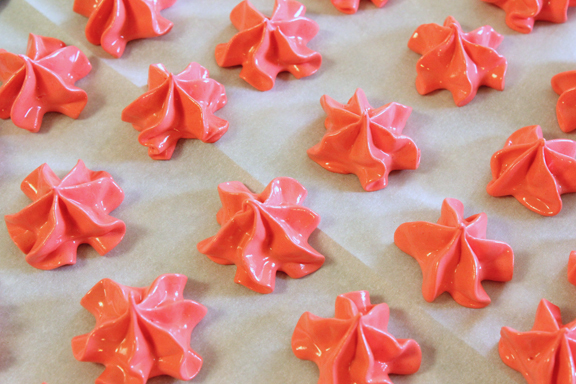 Step 8: Pipe stars onto parchment paper. These stay the same size during baking! So you can put them as close as you need. Don't stress about shape. 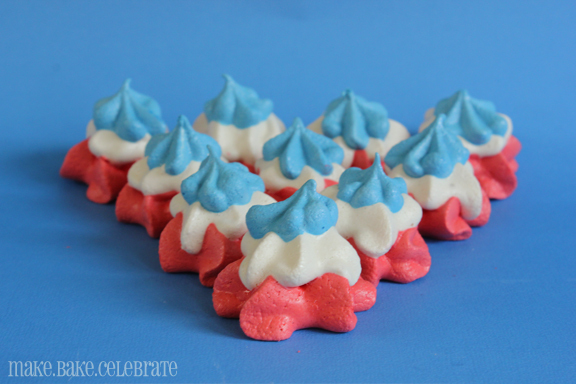 Then use your second piping bag to pipe the white on, then third bag for the blue. 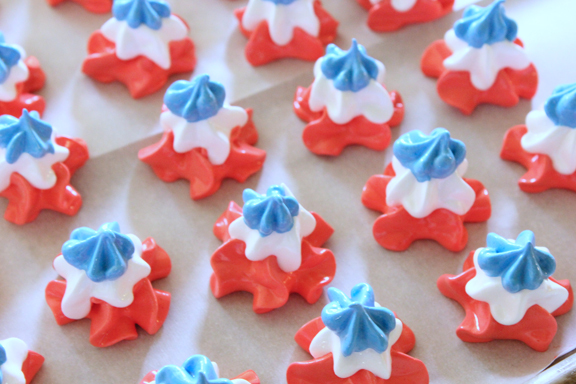 You can layer them appling slightly smaller stars each layer...or simply pipe out all one color stars. 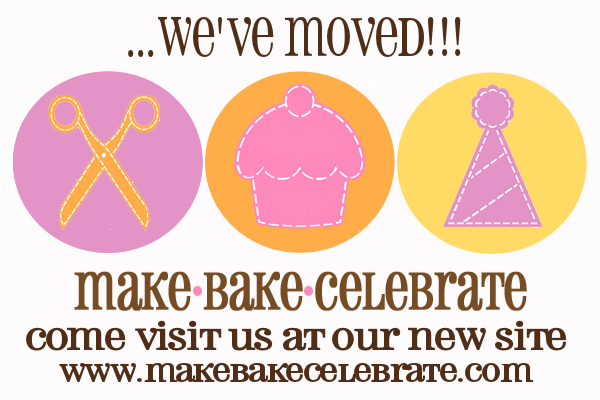 If your new to piping just apply a little bit of presure then release and pull up. 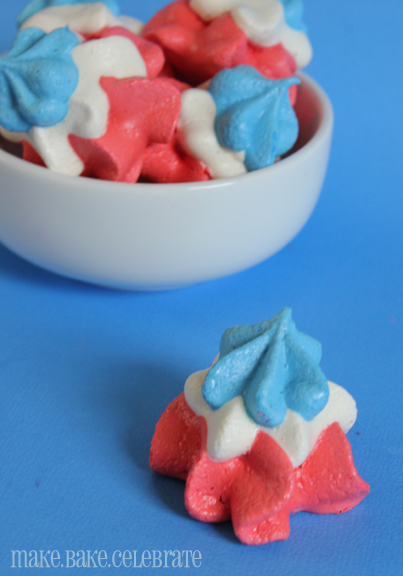 Step 9: If you'd like you can add some 4th of July sprinkles! Now bake at 200 for about 2 hours. Thy will be firm when done but dissolve in the mouth quickly. They really are a great treat for the little ones. Winners Weekend At Duncan Hines!